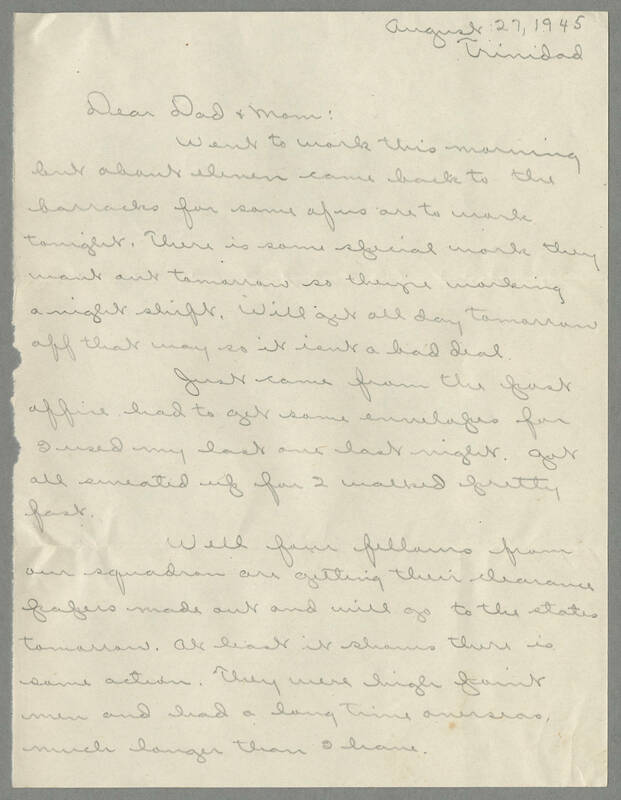 August 27, 1945 Trinidad Dear Dad + Mom: Went to work this morning but about eleven came back to the barracks for some of us are to work tonight. There is some special work they want out tomorrow so they're working a night shift. Will get all day tomorrow off that way so it isnt a bad deal. Just came from the post office had to get off some envelopes for I used my last one last night. Got all sweated up for I walked pretty fast. Well four fellows from our squadron are getting their clearance papers made out and will go to the states tomorrow. A least it shows there is some action. They were high point men and had a long time overseas, much longer than I have.